Soak 100 g barley for 1 hour. Chop 1 onion finely and run it on hot olive oil in a saucepan. Add 4 tablespoon ground almond and 1 tablespoon all purpose flour. Stir it until gets golden. Chop celery root and leaves, a bit of fresh lovage as well as a generous amount of fresh chive, basil, oregano and sage leaves. Add it to the onion-almond mix. Add 1-1.5 l water (depends on how thick soup you want) and a stock cube. Rinse barley and add to the soup when it is boiling. Add salt and cook it slowly until the barley is almost done. 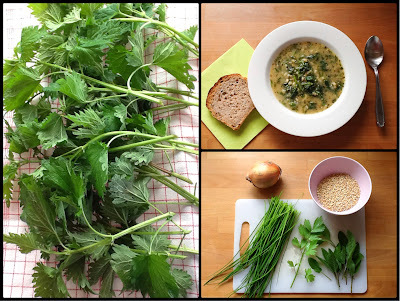 Add a big bunch of fresh, chopped nettle and cook it for 5 more minutes. Serve it with parmesan cheese and brown bread. Posted in Soup/starter. Tags: almond, barley, basil, chive, nettle, oregano, sage on 30/05/2014 by Maagedeli.